The best games are those that don't require any special materials. Of course, Lego bricks will make a certified geek like me drool with anticipation, but when you're on a budget, simple office supplies will do the trick. Paper airplanes are a product that most people are familiar with, and this game puts the pull vs push doctrine into your paper airplane factory. Pete Abilla at shmula.com has posted his version of the popular Paper Airplane Lean game. Previously, we've seen a paper airplane game in action in a video series showing push vs pull. But no printed instructions were available. To the timely rescue comes this description of the paper airplane Lean game, showing detailed folding instructions. I've folded plenty of paper airplanes in my time, but which style is best for a Lean game? The paper folding work for a sleek, pointy airplane has been split up between 4 workers. I haven't tried the simulation myself, but it appears that there's a bottleneck in the process. Bottlenecks are useful in these games, to ensure that inventory builds up, demonstrating the drawback of a traditional push process. In the first round, a push system is modeled, with each worker "encouraged" to make as many as possible, with a carrot on a stick. The instructor sets up buffers between each station in the second round, implementing a simple pull system. Do not create, unless your downstream buffer is empty! Plenty of talking points are included in the blog post, perfect to get your discussion going. 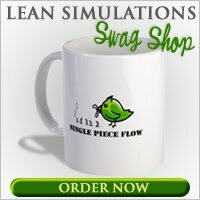 This game has been added to my growing list of free Lean games and simulations.